Not every appointment needs to be a full-fledged balayage technique—look at the magic @camouflageandbalayage (aka Amy McManus) created on her client with wet balayage! It’s a quick way to brighten up the ends on wet hair and blend it with the existing color. “I feel like it’s been gentler to the hair than when I paint in between the foils,” Amy said. Keep reading for a video demo, then get the formula for the look above! Wet balayage is a hair color technique technique that involves many of the same steps as traditional balayage, but it’s done on wet hair instead of dry hair. This balayage technique reduces the time spent in the salon and it produces beautiful end result! The main reason stylists prefer wet balayage vs dry balayage is for faster application times. Many stylists feel that the end result is healthier, gorgeous hair that can go several months as the hair grows out naturally. 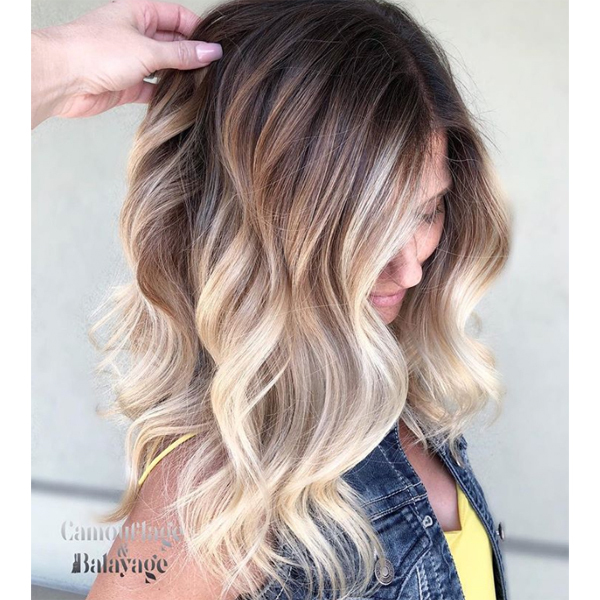 How Do You Apply Wet Balayage? Watch as Amy demonstrates her technique below. 1. On wet hair, apply Formula A to the regrowth. 2. While the regrowth develops, apply Formula B in 2-inch sections to the ends. 3. Develop for 20 minutes, rinse and shampoo. 4. Tone with Formula C on wet hair and develop for 4 minutes. “Her hair was essentially the color I wanted—I just like to close the cuticle with my toner for a few minutes,” Amy shared.